Jvc Kdg162 Cd Radio Fully Tested Free Post🇬🇧. Condition is Used. Dispatched with Royal Mail 2nd Class. JVC CH-X200 12 Compact Disc Changer CD PLAYER INCLUDING CABLE & MAGAZINE,TWELVE. THE SALE IS FOR CHANGER WITH MAGAZINE PLUS THE LONG CABLE PICTURED. 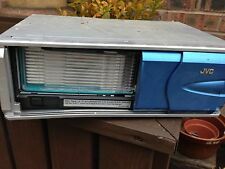 12 CD changer. Lead (Wiring Harness). What you see is what you will get ! Item is in used condition may have usage marks and scratches. JVC CASSETTE RECEIVER KS-FX711/KS-FX511 JVC CASSETTE RECEIVER KS-FX711/KS-FX511 *** UNTESTED *** We know that it definitely takes tape but on the tape flap it also says CD Changer Control and there is an option for CD’s on the control panel this leads me to believe that it would work with a CD Changer attached. The Original JVC head unit box is present and in good condition, there is two pieces of the head unit surround that are snapped (please see photographs for items condition) Also includes Original Manual. FACE ONLY. In good condition. Offers please! Please check out my other listings. So will need soldering or new leads would do . What you see is what you will get ! Item is in used condition may have usage marks and scratches. JVC 12 Disk Cd Changer System And Speakers - BRAND NEW! JVC CH-PK480R 12 Disk Cd Changer system. 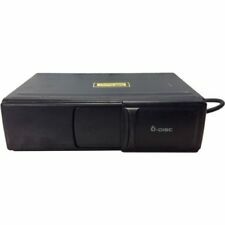 Cd changer is a CH-X550 It is all brand new and still in the box. The wires etc are all in there original sealed packaging. An understated CD Player for what it's worth. A great stereo, loads of functions and a real heavy sounding stereo. Has been used and shows common wear and tear. (see pictures). 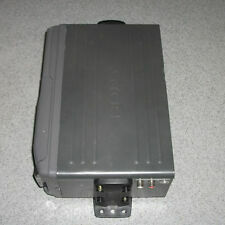 Fully working jvc Xc-m120 12 disc cd changer cartridge. Fully working cd x3 disc cartridge.jvc Xc-m30. 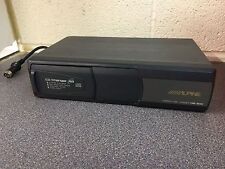 jvc multi disc player in working condition no wires with it. worked fine when removed should fit most cars . JVC KD-G1 51Car Stereo Radio CD MP3 Player 4X45W Used. Lead (Wiring Harness),fitting cage. What you see is what you will get ! Item is in used condition may have usage marks and scratches. JVC KD-G161 Car Stereo Radio CD MP3 Player 4X45W Used. Lead (Wiring Harness). What you see is what you will get ! Item is in used condition may have usage marks and scratches. Lead (Wiring Harness),fitting cage. What you see is what you will get ! Item is in used condition may have usage marks and scratches. Please Contact Dealers To Find Out Code. This Item Will Need To Be Reset, Unlocked And Coded To Your Vehicle By A Qualified Auto Electrician Using Correct Software And Equipment. Is This The Right Part For Your Vehicle? Before Committing to " Buy it now ", It Is Buyer's Responsibility : To Double Check His Own Part Visually & to match photo. To Ensure The Part Is Right And Will Fit His Car. To Match This Part Number : KD-LH1101 30 Days Return Policy. (ForOfficeUseRefMA545). This is in great condition for its age, produced in the 90's. This JVC XC-M120 works well. It holds 12 CDs. ======================================================================================================================. Croatia ab 27.39GBP. Artykuły z łamane lub nie istniejących plomb, etykiet lub pieczęcie jako nieważne w stanie dostawy. Netherlands Antilles Van 32.91GBP. Afghanistan Van 32.91GBP. Canada Van 30.63GBP. IT IS BEEN REMOVED FROMKIA CARNIVAL 2.9 CRDI 2008 YEAR. ONCE AN ITEM IS RECEIVED BACK IT WILL BE QUALITY TESTED ON OUR BENCHES AND CHECKED FOR A MATCH WITH THE ONE SOLD. Compatible Format CD. IN GOOD WORKING CONDITION. Custom Bundle No. Disc Capacity 6. Compatible Format CD. SLEEVE HAS STICKER / STICKER RESIDUE WITH WRITING . UPC Does not apply. IN GOOD CONDITION~. For parts or not working. Please see photos of what you get. Model JVC CH-X350 12 Disc. JVC KD-G322 Radio CD Player + wiring harness. Spares or Repair. JVC KD-G322 Radio CD Player wiring harness. Spares or Repair. It is sold as seen faulty - spares / repair. Wiring harness. Examination of speakers revealed they had been toasted. There is no 'buy' it now option. 4 out of 5 stars - JVC KD-G322 Radio CD Player + wiring harness. Spares or Repair. 4 product ratings4 product ratings - JVC KD-G322 Radio CD Player + wiring harness. Spares or Repair. Used parts will have signs of wear and/or marks scratches. This JVC CH-X350 12 disc changer is pre owned and being sold as is for parts. The unit appears to be in great physical shape. The sliding door to the disc moves without any issues and holds position when closed. Lead (Wiring Harness). Item is in used condition may have usage marks and scratches. What you see is what you will get !